Objective To test the effectiveness of a brief behavioural intervention to prevent weight gain over the Christmas holiday period. Design Two group, double blinded randomised controlled trial. Setting Recruitment from workplaces, social media platforms, and schools pre-Christmas 2016 and 2017 in Birmingham, UK. Participants 272 adults aged 18 years or more with a body mass index of 20 or more: 136 were randomised to a brief behavioural intervention and 136 to a leaflet on healthy living (comparator). Baseline assessments were conducted in November and December with follow-up assessments in January and February (4-8 weeks after baseline). Interventions The intervention aimed to increase restraint of eating and drinking through regular self weighing and recording of weight and reflection on weight trajectory; providing information on good weight management strategies over the Christmas period; and pictorial information on the physical activity calorie equivalent (PACE) of regularly consumed festive foods and drinks. The goal was to gain no more than 0.5 kg of baseline weight. The comparator group received a leaflet on healthy living. Main outcome measures The primary outcome was weight at follow-up. The primary analysis compared weight at follow-up between the intervention and comparator arms, adjusting for baseline weight and the stratification variable of attendance at a commercial weight loss programme. Secondary outcomes (recorded at follow-up) were: weight gain of 0.5 kg or less, self reported frequency of self weighing (at least twice weekly versus less than twice weekly), percentage body fat, and cognitive restraint of eating, emotional eating, and uncontrolled eating. Results Mean weight change was −0.13 kg (95% confidence interval −0.4 to 0.15) in the intervention group and 0.37 kg (0.12 to 0.62) in the comparator group. The adjusted mean difference in weight (intervention−comparator) was −0.49 kg (95% confidence interval −0.85 to −0.13, P=0.008). The odds ratio for gaining no more than 0.5 kg was non-significant (1.22, 95% confidence interval 0.74 to 2.00, P=0.44). Conclusion A brief behavioural intervention involving regular self weighing, weight management advice, and information about the amount of physical activity required to expend the calories in festive foods and drinks prevented weight gain over the Christmas holiday period. Trial registration ISRCTN Registry ISRCTN15071781. In 2015, 603.7 million adults globally were estimated to be obese, with more than 70 countries showing a doubling in prevalence of obesity since 1980.1 Little long term success has been found in treating established obesity through lifestyle change,2 perhaps because of the substantial, permanent changes in diet and physical activity required to achieve and sustain weight loss. An alternative strategy is to focus on prevention of weight gain, but evidence evaluating the effectiveness of interventions for weight gain prevention is limited.34 Reports from longitudinal weight tracking studies show that each year on average the population gains a small amount of weight (0.4-1 kg),5 but that weight is gained more rapidly during particular periods, such as the Christmas holiday season.67 A narrative review of weight gain during the holiday season reported consistent increases in weight of 0.4 kg to 0.9 kg across several studies.8 Furthermore, these weight gains were not fully lost in the months following the holiday event. Although these gains are small, over 10 years they would lead to a 5-10 kg increase in body weight, which is sufficient to drive the obesity epidemic. 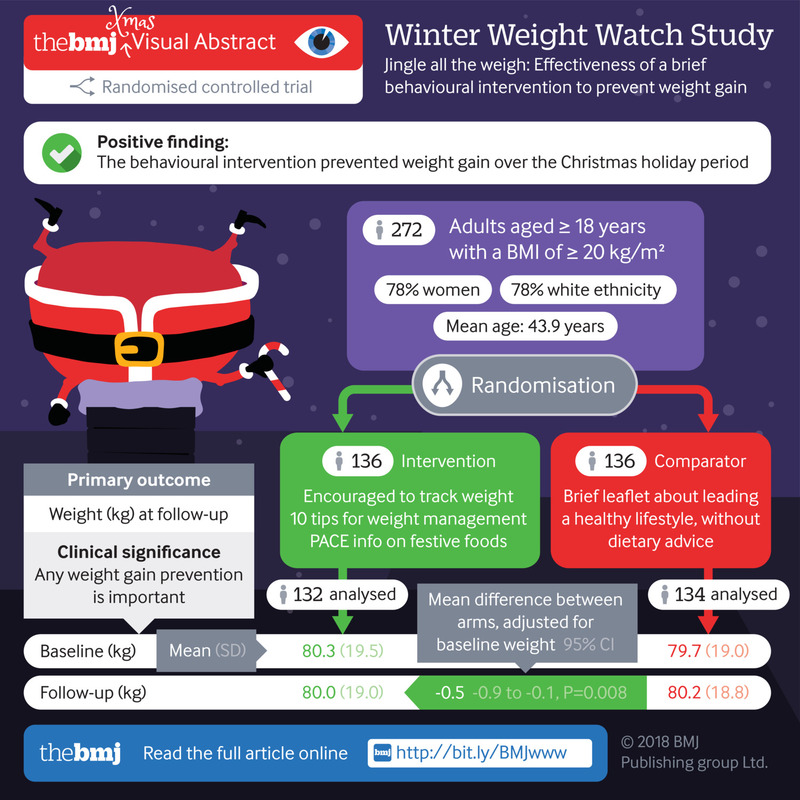 We conducted the Winter Weight Watch Study, a randomised controlled trial to evaluate the effectiveness of a brief behavioural intervention encouraging restraint of eating and drinking over the Christmas holiday period to prevent weight gain. The study was a two group double blinded randomised controlled trial designed to test the effectiveness of a brief behavioural intervention comprising encouragement to regularly self weigh, tips for weight management, and information on the physical activity calorie equivalent (PACE) of festive foods and drinks to prevent weight gain over the Christmas period. Participants were individually randomised to trial groups. Participants were recruited from local workplaces, social media, and local schools (parents) through flyers and posters. We engaged with workplaces through human resources departments and company communication officers. Staff at schools that had previously taken part in research at the university were asked to distribute posters to parents. Researchers screened potential participants who contacted the research team. Participants were eligible for inclusion if they were aged 18 years or more and had a body mass index (BMI) of 20 or more. We excluded pregnant or breastfeeding women and those with insufficient English to provide written informed consent. Collection of baseline data took place pre-Christmas 2016 and 2017 (November and December) with follow-up post-Christmas 2017 and 2018 (January and February), respectively. Eligible participants were asked to attend two appointments (baseline and follow-up) with a researcher, either at the participant’s home or at a convenient location (workplace, community venue, university). Baseline and follow-up appointments were arranged concurrently. To reduce the possibility of missed appointments, we sent reminder letters to participants one week before their appointments. We also collected data relating to personal characteristics and lifestyle behaviours through a questionnaire booklet distributed to participants at baseline and follow-up. To assess generalisability of the intervention we collected data on whether participants had access to weighing scales at home. The multicomponent intervention was informed by self regulation theory17 and the habit formation model18 and aimed to promote restraint of energy consumption. The intervention comprised three components: encouragement to self monitor and record weight at least twice weekly (ideally daily), and instruction to reflect on weight trajectory; 10 tips for weight management; and pictorial information about the physical activity calorie equivalent (PACE) of festive foods and drinks (see supplementary file S1). The comparator group received a brief information leaflet, amended from general public health information, about leading a healthy lifestyle.27 No dietary advice was included (see supplementary file S2). The primary outcome was weight at follow-up. We compared weight between study groups at follow-up, adjusted for baseline weight and attendance at a commercial weight loss programme. We compared several secondary outcomes between the trial groups at follow-up: weight gain of 0.5 kg or less, self reported frequency of self weighing (at least twice weekly versus less than twice weekly), percentage body fat, and cognitive restraint of eating, emotional eating, and uncontrolled eating. The relation between overweight and mortality is linear (30% increase per 5 kg/m2)29 therefore the prevention of even small amounts of weight gain sustained over the lifetime can have important health benefits.30 We proposed a sample size based on an effect size of 0.75 kg difference in weight between the groups at follow-up. We chose this pragmatically as an effect size that we could realistically expect to achieve from a brief intervention over a short period. A total of 226 participants would provide 80% power to detect 0.75 kg (SD 2.0)30 difference in weight between the groups, with 5% significance. With allowance for 20% loss to follow-up, the required sample size was 284. A researcher individually randomised participants at the baseline visit. An independent statistician generated the random allocation sequence with random block sizes of 4, 6, and 8 using STATA software (version 14.2, StataCorp, College Station, TX). Randomisation was stratified by participant attendance at a commercial weight loss programme at baseline. 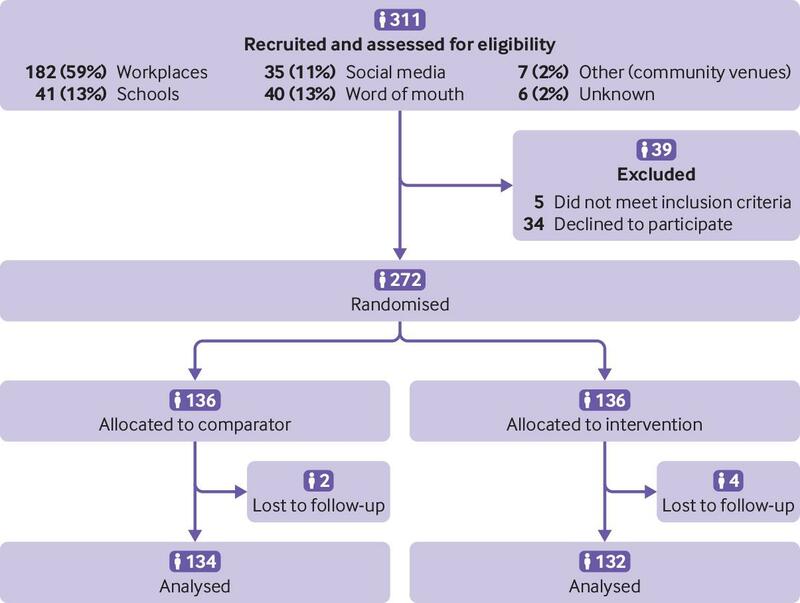 This stratification variable was chosen because commercial weight loss programmes have been shown to be effective interventions for weight loss.31 Data on attendance at these programmes were collected at baseline. Participants were then randomised, and allocation was concealed using opaque, sequentially numbered, sealed envelopes. Participants were blinded to the aim of the trial (we said the study was about weight gain in winter) and their allocation until the end of the study. Researchers were blinded to group allocation and baseline weight during follow-up appointments. The sealed envelope with this information was opened after follow-up body weights had been measured. To maintain blinding of the researcher to assignment groups, we requested that participants did not reveal the information given to them at baseline. A prespecified statistical analysis plan was made available before analyses. The primary analysis was by modified intention to treat—including all randomly assigned participants for whom data on the primary endpoint were available. We used linear regression modelling to assess the primary outcome, with weight at follow-up as the outcome variable, trial arm as the explanatory variable of interest, and baseline weight and the stratification variable (attendance at a weight loss programme) as covariates. The difference in weight between the intervention group and comparator group is presented as an adjusted mean with corresponding 95% confidence interval and P value. The unadjusted change in weight between baseline and follow-up for both groups is also presented. The primary outcome analysis was repeated with additional covariates (BMI and time (days) between baseline and follow-up). We analysed other continuous outcomes (percentage body fat, cognitive restraint, emotional eating, and uncontrolled eating) as the primary outcome (adjusted for baseline measures and the stratification variable) and repeated with the additional covariates. To estimate the odds ratio (comparing intervention group with comparator group) for gaining 0.5 kg or less of baseline weight at follow-up and frequency of self weighing (at least twice weekly), we used logistic regression models, adjusting only for the stratification variable (and baseline for the self weighing outcome) and then including the additional covariates. These results are presented as adjusted odds ratios with corresponding 95% confidence intervals and P values. Before commencement of the trial, patient and public involvement representatives provided feedback on the research question, study design, study concept, and content of the study materials. We used these responses to refine and inform specific elements of the trial. A total of 272 adults were randomised (n=93 in 2016 and n=179 in 2017). Figure 1 shows the flow of participants through the study. Six participants (2%) failed to provide follow-up data for the primary outcome. The participants were predominantly women (n=213 (78%)) and of white ethnicity (n=201 (78%); table 1). The mean age was 43.9 (SD 11.7) years, and 25% (n=67) of participants were from areas of high deprivation. Mean length of time in the study was 45.3 (SD 5.7) days. Participants’ baseline characteristics were generally well balanced across the two study groups (see table 1 and supplementary file S3). Supplementary file S4 shows the mean time in study for each randomisation group per year. The unadjusted mean weight change (follow-up−baseline) was −0.13 kg (95% confidence interval −0.4 to 0.15) in the intervention group and 0.37 kg (0.12 to 0.62) in the comparator group. The adjusted mean difference in follow-up weight between groups (intervention−comparator) after adjustment for baseline weight and attendance at a commercial weight loss programme was −0.49 kg (95% confidence interval −0.85 to −0.13, P=0.008)—that is, follow-up weight was lower in the intervention group than comparator group. The result was similar when further adjusting for baseline BMI and the time participants were in the study (−0.48 kg, −0.84 to −0.12; P=0.01; table 2). The estimated reduction in percentage body fat in the intervention group compared with comparator group was small and non-significant (−0.03%, 95% confidence interval −0.53% to 0.47%, P=0.91 in the further adjusted model). The model adjusted only for baseline percentage body fat, and the stratification variable provided a similar result. The odds of gaining no more than 0.5 kg weight was higher for those in the intervention group than comparator group, but this was non-significant (1.23, 95% confidence interval 0.75 to 2.04, P=0.41). Those in the intervention group had increased odds of self weighing at least twice weekly (64.96, 95% confidence interval 24.48, 172.39, P<0.001). Cognitive restraint scores increased significantly for the intervention group compared with comparator group at follow-up (mean difference in further adjusted model: 0.62, 95% confidence interval 0.06 to 1.19, P=0.03). Estimated differences in emotional eating and uncontrolled eating scores were non-significant (table 2). In this randomised controlled study, a brief behavioural intervention that encouraged adults to weigh themselves regularly, offering advice for weight management and information about the physical activity calorie equivalents (PACE) of popular festive food and drinks prevented weight gain over the Christmas period. Although the difference in weight we detected was marginally smaller than the estimate of effect size used in our sample size calculation, it is still important29 given that the relation between weight and mortality is linear and any weight gain prevented will have a positive impact on health outcomes. Our secondary outcome of reducing the proportion of participants gaining at least 0.5 kg was not statistically significant, but the trial was not powered to detect a difference in this outcome. The null finding for percentage body fat might result from the difficulty in detecting small changes in adiposity using bioelectrical impedance.32 In line with the aims of the intervention, participants in the intervention group were more likely to weigh themselves at least twice weekly than their comparators. We hypothesised that the intervention would work by encouraging participants to reflect on their food and drink consumption and take action if their weight began to increase; we found evidence that this occurred in participants in the intervention group, who showed statistically significantly higher cognitive restraint of eating scores post-intervention than participants in the comparator group. Alcohol consumption seemed to be marginally higher in the comparator group at baseline (consumed alcohol in past week? Yes: 70% comparator v 61% intervention. See supplementary table S3). As alcohol can contribute considerably to energy intake, interventions to prevent weight gain at Christmas could be enhanced by an increased focus on reducing the consumption of alcoholic drinks. Studies have shown that weight increases significantly during holiday occasions (0.4-0.9 kg)8 and accounts for most of annual weight gain.56 Low intensity interventions targeting high risk periods such as Christmas could be an important contributor to obesity prevention efforts in the population. Few trials have tested interventions for weight gain prevention in adults. One systematic review reported that only nine randomised controlled trials have been published in 10 years.3 Furthermore, no trial has tested brief (<10 weeks) interventions. Most have reported interventions that result in small to modest changes in weight between groups at follow-up. Several studies have reported a statistically significant difference in weight between intervention and comparator group of 1.0 kg and 3.5 kg.333435363738 All successful interventions were multifactorial and intensive, consisting of dietary, behavioural, and physical activity elements and with regular contact and support. Interventions varied in duration, and the substantial heterogeneity of interventions made comparisons difficult. The review authors concluded that the less intensive interventions incorporating self monitoring of weight in addition to general dietary advice, physical activity recommendations, and behaviour change components could be more successful at preventing the small gains in weight observed in populations over time and that studies to test this were required. We found that a brief intervention of between four to eight weeks that prompted participants to restrain their eating and drinking during a high risk period for weight gain, can be effective. Although this intervention was successful in preventing weight gain, it was multicomponent and therefore not possible to determine the effectiveness of the individual factors, although we did find that participants in the intervention group were more likely to weigh themselves at least twice weekly than those in the comparator group. Additionally, evidence from other studies suggests that each of the intervention components can be effective in facilitating weight management. Previous prevention trials that included self weighing reported associations between frequent self weighing and weight change.3 In one study, however, self weighing was not found to be associated with weight change,34 which could have been the result of the low level of adherence to self weighing and which was not the case in our study. In addition to offering participants tips for good weight management we considered it important to highlight the calorie content and demands of popular food and drinks. This is because studies have shown that people often underestimate the energy content of foods4041 or do not understand the amount of physical activity required to expend energy dense foods42; foods that are more often consumed at Christmas.43 By highlighting this information, we hypothesised that participants would show restraint of eating and drinking. Studies have shown the provision of PACE information to be associated with lower energy meals being chosen from menus and therefore consumed at meal times, with encouragement to be more physically active.4445 Collectively, although PACE information and labelling seems promising in helping people to understand the energy costs of foods and drinks, particularly at high risk times such as Christmas, further research is required to investigate the effectiveness of such an approach. The intervention was novel and designed to be easily implemented if effective. Loss to follow-up was low (2%), reducing the potential for bias. With the larger sample size, it was possible to detect a smaller effect than we had used in planning the study. The power calculation was also conservative as it did not allow for the adjustment of baseline weight in the analysis. This high follow-up rate could be because participants engaged well with the study or because the follow-up period was short. We also reimbursed participants for their time when they provided data at the follow-up time point (£10 high street shopping voucher). People were recruited from a range of ethnic groups and with varied BMI and deprivation status, which increases the generalisability of the findings and has the potential to reduce health inequalities. The PACE information on Christmas foods and drinks used in the study was tailored to the local cultural context but could easily be adapted for use in other settings with different types of foods and drink consumed during festive periods. In our study, 83% (n=230) of participants had access to weighing scales at home. This supports the ease of implementation of our intervention. Men can be difficult to recruit to weight management trials,46 but a relatively high proportion (22%) participated in our study. Participants were blinded to the aim of the study and the researchers who collected outcome data at follow-up were also blinded to group allocation until after weight had been measured. Although we blinded participants to the main outcome of the study and did not explicitly state its intention, our recruitment materials requested volunteers for a study to prevent weight gain during winter. It is possible we recruited people with better health awareness although we were able to recruit people with a range of BMI status. Participants were mostly women in the healthy or overweight BMI categories and although these are important target groups, this could limit the generalisability of our findings. A brief intervention underpinned by self regulation theory,17 consisting of encouragement to regularly self weigh, tips for weight management, and PACE information prevented weight gain in adults over the Christmas period. Cognitive restraint of eating was increased in the intervention group. These results should be considered by health policy makers to prevent weight gain in the population during high risk periods such as holidays. We thank the participants and researchers (Sue Clifford, Christina Kerin, Ryan Griffin, Janice Gunnell) for making this trial possible and the schools, workplaces, and social media groups for supporting recruitment to this trial. Contributors: AJD conceived the study with input from AF. AJD wrote the protocol with contributions from AF and FM. FM wrote the first version of the manuscript with input from coauthors. FM, AJD, AF, and MP wrote the statistical analysis plan with input from AS and CE. CE conducted the statistical analyses with support from AS. All authors had full access to the data, take responsibility for the integrity of the data and the accuracy of the data analysis, contributed to the interpretation of the results, and reviewed and approved the final manuscript. AJD is the guarantor. The corresponding author attests that all listed authors meet authorship criteria and that no others meeting the criteria have been omitted. Funding: This work was independent research as part of a PhD studentship funded by the School of Medical and Dental Sciences at the University of Birmingham. This paper presents independent research supported by the National Institute for Health Research (NIHR) Birmingham Biomedical Research Centre at the University Hospitals Birmingham NHS Foundation Trust and the NIHR Leicester Biomedical Research Centre. The views expressed are those of the authors and not necessarily those of the NHS, the NIHR, or the Department of Health. Competing interests: All authors have completed the ICMJE uniform disclosure form at www.icmje.org/coi_disclosure.pdf and declare: no support from any organisation for the submitted work; no financial relationships with any organisations that might have an interest in the submitted work in the previous three years, no other relationships or activities that could appear to have influenced the submitted work. AF reports grants from Ethicon (Johnson and Johnson), researcher led, outside the submitted work. Ethical approval: This study was approved by the University of Birmingham Science, Technology, Engineering and Mathematics ethical review committee (ERN_16-0673). All participants provided written informed consent. Data sharing: Data from the Winter Weight Watch study or the study materials are available from the corresponding author at a.c.farley@bham.ac.uk. All individual participant data will be available on request one year after publication of trial outcomes. The study protocol is available on request. All requests for data access will need to specify the planned use of data and will require approval from the trial investigator team prior to release. Transparency: The guarantor (AJD) affirms that this manuscript is an honest, accurate, and transparent account of the study being reported; that no important aspects of the study have been omitted; and that any discrepancies from the study as planned have been explained. The manuscript follows the CONSORT guidelines for the reporting of clinical trials.
. The self-regulation of health and illness behaviour.Routledge, 2003.
. Habit. Am J Psychol1903;14:121-49.
. How are habits formed: Modelling habit formation in the real world. Eur J Soc Psychol2010;40:998-1009doi:10.1002/ejsp.674. NICE. Managing overweight and obesity in adults–lifestyle weight management services. 2014.